The first restaurant meals served in Frankenmuth were served in the Exchange Hotel built on this site in 1856, just eleven years after the founding of Frankenmuth in 1845. In recognition of over 150 years of serving over 30,000,000 guests from around the world, we present our story. The stories of Frankenmuth and Zehnder’s are inextricably linked. Begun with a purpose and continued with a passion, both have prospered. Family success stories flourish in Frankenmuth. The foundation to ours is William and Emilie Zehnder. The financial burden of supporting a family of eight proved overwhelming. Interest was sparked in the closed New Exchange Hotel across the street from what appeared to be a thriving restaurant, Fischer’s Hotel. In December 1928, William and Emilie sold their 80-acre farm and borrowed the rest of the money for the $8,000 down payment, and bought the New Exchange Hotel. After an extensive remodel taking inspiration from Mount Vernon (the home of George Washington) Zehnder’s opened for business on Mother’s Day 1929. On that day they served 312 guests for $1.00 each. William and Emilie purchased the New Exchange Hotel just eight years after Prohibition was enacted. Prohibition was a conflict for William in that alcohol, primarily beer, was part of the culture of Frankenmuth. Many businesses, including Zehnder’s and Fischer’s (now the Bavarian Inn) sold alcohol to the “right customers”. Zehnder’s and Fischer’s were raided by Federal agents on July 30, 1930. William and Emilie, along with Herman and Lydia Fischer, were arrested and spent the evening in the Saginaw County Jail. Bond for the Zehnder’s was set at $5,000 and $8,000 for the Fischer’s. The Great Depression, in addition to the fine levied during Prohibition, nearly brought the dream of the family business to an end. On one day during the Depression receipts at Zehnder’s totaled only seven cents; a Speckled Sport cigar was purchased by Fred Goetzinger. The first mention of the neon sign in front of Zehnder’s appears in the October 1936 edition of the Frankenmuth News. It is believed to be one of the longest continually used neon signs in existence. After WWII the business grew rapidly. America was on wheels and tourism began to flourish in Michigan. On March 10, 1947 William turned over the business, debts and all, to his two daughters and five sons. There is little doubt that the Fischer family originated the Family Style Chicken dinner in Frankenmuth. The Zehnder family had the opportunity to buy the competition, Fischer’s Hotel, and did so in January of 1950. William “Tiny” Zehnder, Jr., was named manager. In May of 1955, Tiny Zehnder discussed the idea of “adding atmosphere” to Fischer’s Hotel by adding Bavarian architecture. By 1958 the Zehnder brothers and sisters had agreed on a new Bavarian themed addition to the south of Fischer’s Hotel. The family agreed to change the name to the Frankenmuth Bavarian Inn. The June 1959 grand opening of the Bavarian Inn was a huge success and continues to this day as Frankenmuth’s Bavarian Festival. In 1965, Eddie and Tiny purchased the business from their remaining brothers and sisters. The partnership of Eddie and Tiny was a match made in business heaven. Much of what Tiny and Eddie built and envisioned (together with Wally Bronner, originator of Bronner’s CHRISTmas Wonderland), formed the tourism industry in Frankenmuth. Zehnder’s of Frankenmuth is driven by their vision, “…..to be the #1 choice in one of Michigan’s premier tourist destinations, Frankenmuth,”. 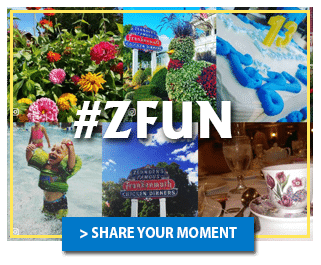 … In order to make good on that vision the company has focused our four core areas of business (dining, lodging, retail and golf) toward becoming the “Zehnder’s Experience” a four-season, service-oriented, family destination. Third generation family members involved in the business include Albert F. Zehnder, Chairman and CEO; Linda Susan Zehnder, V.P. of Human Resources; Martha Zehnder Shelton, CFO; and John Zehnder (son of Herman Zehnder), Certified Executive Chef and Food and Beverage Director. William A. Parlberg was named the first non-family President in the history of Zehnder’s in 2001. Many fourth generation family members are currently working in the family business. In 1984, Zehnder’s purchased the then 9-hole Frankenmuth Golf and Country Club. After a complete re-design and expansion to 18 holes a “new” championship course, The Fortress, was opened in 1992. In 1998 Golf Digest named The Fortress one of the top 450 public courses to play in the United States, Canada, Mexico and the Caribbean. In 1984, Zehnder’s invested over $1 million in bakery equipment and expanded the retail baked good line and retail sales area. In 1986, Bakery magazine recognized Zehnder’s bakery as the nations top retail bakery. In 1988, Zehnder’s purchased the 114-room Bavarian Haus Motel. A remodel in 1992 added additional rooms, four suites and an indoor pool. In 2004, Zehnder’s decided to take the Bavarian Haus Motel to the next level of “lodging as family entertainment”. A section of the original building was demolished to make room for 30,000 square feet of indoor water park, arcade, dining and 63 new family suites. The new 152-room indoor water park hotel, Zehnder’s Splash Village, opened June 2005. Nearly ten years later, Zehnder’s Splash Village expanded to 50,000 square feet including an additional waterpark – Atrium Park, 32 new guest rooms featuring panoramic views of the waterpark, Mushroom Grille concession area, and many new thrill slides and amenities. In the fall of 1991 the concept of a snow and ice carving festival was presented to John Shelton, Zehnder’s V.P. of Marketing and Sales. To the amazement of everyone, the first Zehnder’s SnowFest held in 1992, attracted over 90,000 people. Zehnder’s SnowFest has grown into one of the premier winter events in the nation attracting more than 200,000 visitors each year in addition to the best snow and ice carvers in the world. Eddie Zehnder remarked that he was very proud of the many accomplishments his family made in Frankenmuth, but there was no time to rest on their laurels. “What would hurt me the most if someday people came to Frankenmuth and said, I remember when they had a good restaurant”, said Eddie Zehnder. “I don’t ever want to look back and see that happen. We’ve worked too hard to make this happen”. Although much has changed through the decades, each generation has continued their commitment to the “Tradition of Good Taste” begun in 1856. For a more detailed presentation of the history of Zehnder’s of Frankenmuth, be sure to see our history wall located just off the main lobby of our world famous restaurant. Just off Zehnder’s Restaurant’s Main Lobby, our history wall tells the story of Zehnder’s from our beginning in 1856 to present.